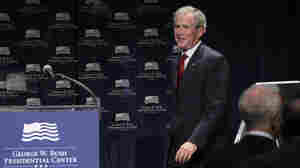 July 25, 2012  There will be votes today on Democratic and Republican plans regarding the Bush tax cuts. But neither will mean much since the House isn't likely to agree to anything the Democratic-controlled Senate does. July 10, 2012  President Obama is in Iowa pushing his plan to extend tax cuts to the middle class — but not the wealthiest Americans. 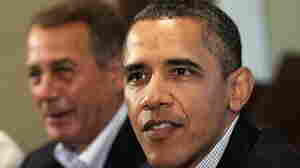 Mitt Romney is in Colorado accusing Obama of outsourcing jobs. Both states are up for grabs this November. July 9, 2012  Democrats opposed the Bush tax cuts in the early 2000s. But now President Obama is calling for a second extension of the cuts for some Americans, and Republicans are lining up in opposition. So whose tax cut is it anyway? July 9, 2012  The White House and Republicans have been at odds over what to do before the tax cuts expire at the end of this year. Today, the president is staking out his latest position. May 29, 2012  The Bush-era tax cuts expire at the end of the year, along with the payroll tax break; the nation's borrowing authority bumps against its limit; and huge mandatory spending cuts — half targeting defense — are set to kick in. All this could trigger another recession, but Congress is unlikely to do much about it until after November's election.